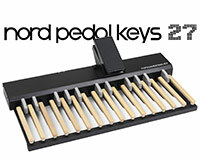 A MIDI pedal board with 27 keys, equipped with an integrated swell pedal, housed in a sturdy aluminum chassis. Church on Sunday mornings, clubs on Saturday nights the new Nord C2 Organ plays both places just right. The Nord C2 raises the performance bar a bit further - this is the new organ for others to compare against. 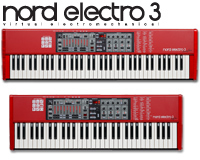 Pianos from the Nord Stage, organs from the C1, compatible with the Nord Sample Library and stunning effects - you will get your hands and ears full of satisfaction with the Nord Electro 3. Clavias award-winning technology and design in a full range stage keyboard, featuring 3 organ types, several electromechanical and acoustic pianos, 3 expressive synthesis systems plus a massive effect section. Use your own wave-files! The fabulous Nord Wave allows you to integrate digital samples in an analog environment! Massive waveform capabilities, filters and effects will generate sounds most definitely never heard before. The first groundbreaking, earthshaking virtual analog synth now available with extra everything; extra voices, extra sounds and extra crisp audio quality.